Hello-Hello, happy top of the new week to all of our treasured readers. We begin today with a look at a brand we haven’t chatted about much (if at all) in this space, one with a name and history many will recognize, Boast. We have been reading about the brand’s return for some time now; word that women’s pieces are now available makes us think the company’s rebirth merits a post. Launched in the 1970s, Boast was a standard on squash and tennis courts, seen on everyone from the Yale squash team to these notables. The shirts, a preppy icon, were launched in Greenwich, Conn., in 1972 by All-American squash and tennis player Bill St. John. “Everyone was wearing Lacoste, but the cool camp counselors were wearing Boast,” says (John) Dowling, a former New York University film student who worked in advertising. The brand is currently in about 24 doors, including Scoop, By George in Austin, Conveyor at Fred Segal and Murray’s Toggery in Nantucket. Polo shirts for men and women, which retail for $68, are the brand’s core category, rounded out by T-shirts, neckwear, casual jackets, blazers and accessories. Below we show some of the basics for men. As mentioned, women’s apparel is now available. 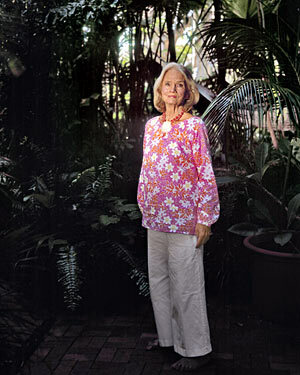 These are the basic tennis shirts ($68) for women. As with any brand we continue to monitor products closely, doing our best to stave off unwarranted attacks of Logophobia. That is why we like these tees, the logo is embroidered in the same color as the shirt. The company is also adding pieces by Minnie Mortimer. Two women’s knit dresses by Ms. Mortimer. For those unfamiliar with Ms. Mortimer, she is very much a product of the UES (Upper East Side) and a clothing designer in her own right. Below we see the designer in one of her own creation on the left, and in a Beyond Vintage piece on the right. In an odd coincidence, last week we chatted about Minnie’s former sister-in-law, Tinsley Mortimer. For those wondering if/how the two get on, here is more from a Page Six story dating back to 2010. Tinsley Mortimer’s reality show, “High Society,” debuted last night on the CW network — but not everyone in her family is thrilled about it. Of course, that is an old tidbit, perhaps things have thawed. Or not. Spade, who previously helped co-found Kate Spade and Jack Spade, is co-creative director at Partners & Spade, an independent advertising and branding agency whose clients include J. Crew, Warby Parker and Target. Spade previously worked on the relaunch campaign for Boast two years ago but has now taken on a more active role in the company and is hammering out a potential financial stake in the brand. I grew up wearing Boast every summer at tennis clinic (sounds so medical!) at The Meadow Club in Southampton. The preppy brand the cool gear to wear because the label’s symbol looked like a pot leaf (it’s actually a Japanese maple leaf). Who would have known? The brand has long catered to country clubs but with a youthful, hip edge that set it apart from competing active brands. Its logo, prominent on its polo shirts, is officially a Japanese maple leaf but is often mistaken for a cannabis leaf. For a fab Hamish Bowles piece on the show from Vogue, click here. This year’s Gala offers something new for those of us not attending whose invitations were somehow misplaced. Through the magic of fairy dust and other things-we-don’t-understand-but-do-appreciate, you can watch the red carpet live this year. The live feed will be available on Vogue.com, Amazon.com/Fashion, and metmuseum.org/metgala. That’s it for now, g’bye until next time! Popped or Not, Nantucket or the Vineyard? For those who don’t summer an entire season at the shore it is once again that time of year, friends and families are packing up and heading off for for a few days at the beach. That makes a story in today’s Boston Globe perfect reading, it looks at two of our favorite places. “Islands Apart” considers the age-old debate about which is the preferred island: Nantucket or Martha’s Vineyard…? The story suggests that perhaps sentiments on the topic have intensified. The story hones in on an aspect of the rivalry that may be easiest to envision, fashion differences between ACK and the Vineyard, more specifically, brands. Full disclosure #2: your trusty correspondent does not ascribe to the popped collar practice. With no disrespect to those who do, we never have, it is more-than-unlikely we ever will. 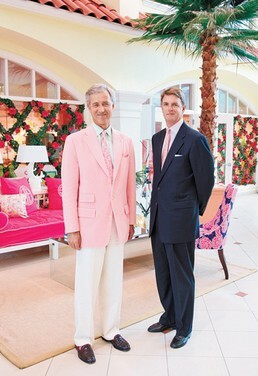 When presented with Graham’s assessment, John Murray, the latest generation of his family to own Murray’s Toggery Shop in Nantucket, the birthplace of Nantucket Reds – perhaps the quintessential preppy trouser – did not dispute the pop-collared joke. Your thoughts? Is one or the other considered a favorite? Also today, a quick update on this weekend’s Red Cross Ball in Monaco. Below we see newlyweds Prince Albert and Charlene, behind them you can just about see the Prince’s sisters, Princesses Caroline (L) and Stephanie. Princess Charlene wore a deep fuchsia gown by Akris, as well as a custom-made necklace by Van Cleef and Arpels. As an update to our post that shared some of the rumors about the couple’s relationship and marriage, the Palace says those reports are untrue; the couple is suing L’Express, a French magazine that printed allegations about the Princess trying to flee the country just days before her wedding. Hmmmm. Finally today, an early look at one of the soon-to-be-released ads promoting the upcoming Missoni for Target collection. The enormous collection launches September 13, and will be a major component of Targét’s Fashion’s Night Out event. We’ll be back on Wednesday, until then may the sun be shining on your island, wherever it may be. Is the holiday frenzy beginning to hit you? Here at the Prepatorium we are definitely encountering some, oh, let’s call it the Enhanced Stress Syndrome, how does that sound? A little more civilized we think than ‘bug-eyed mad,’ a favorite phrase of the Consort. Well, to brighten your holiday, before you read the rest of today’s post remember to enter the Preppy Princess Giveaway by leaving a comment today (or on any Princess post for that matter) with a holiday wish. That’s it, and you are entered for more than $60 in goodies from the Preppy Princess! Brooks Brothers is everywhere it seems, starting with WWD’s story on their 5th Annual fundraising party for St. Jude Children’s Research Hospital, held at the 5th Avenue store. Below, Gossip Girl stars Chace Crawford and Taylor Momsen with Brooks CEO Claudio Del Vecchio. That is Ed Westwick with Jessica Szohr, shortly after co-star Chace Crawford left the trio to catch his plane. The very next item in the W Editor’s Blog is “Prep Rally,” featuring an outfit comprised of preppy elements. Speaking of Cole Haan, their online store continues offering an additional 30% off all Sale styles with promo code DECSALE30. Musician Michael Stipe of R.E.M. designed the shirt; it is available in a number of colorways. This was part of Visionaire’s 54th issue, honoring Lacoste’s 75th Anniversary, a topic covered fairly extensively by TP in this July post. And quick update on JCrew–still a mess. I was on the phone yesterday because some of my items were oddly cancelled for no reason and yes, still not shipped out. TP is in heaven. Truly. 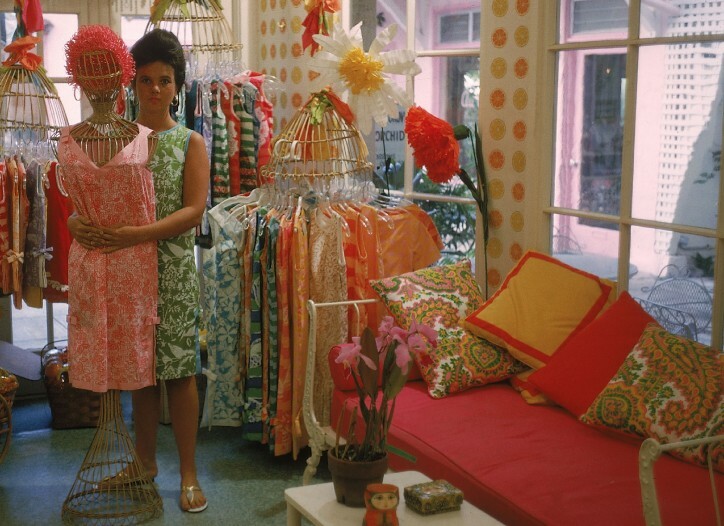 For those less familiar with the Lilly Pulitzer brand, it was started in 1958 by Lilly Pulitzer…. … rapidly becoming very successful into the early 1980’s. And then – horrors! The line ceased operating in 1984 and all hope was lost for true Lilly lovers. Life began anew in 1994 when Scott Beaumont and James Bradbeer Jr. (seen below) decided to buy the company and bring the storied line back to life. And it gets better moving forward: the company plans to grow the brand through the addition of a stationery and gift line. How fabulous is this news?! The paper line is on track to launch in January. If you would like to be on the mailing list for updates on the line and other announcements, just click here to be taken to the Lifeguard Press site. As well as an intriguing look at the design process. 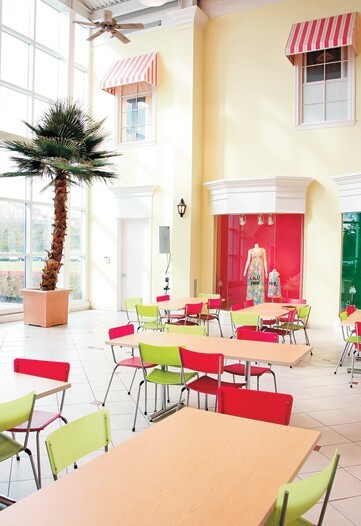 Have you ever wondered just how the company continues to come up with such smashing colors and designs? 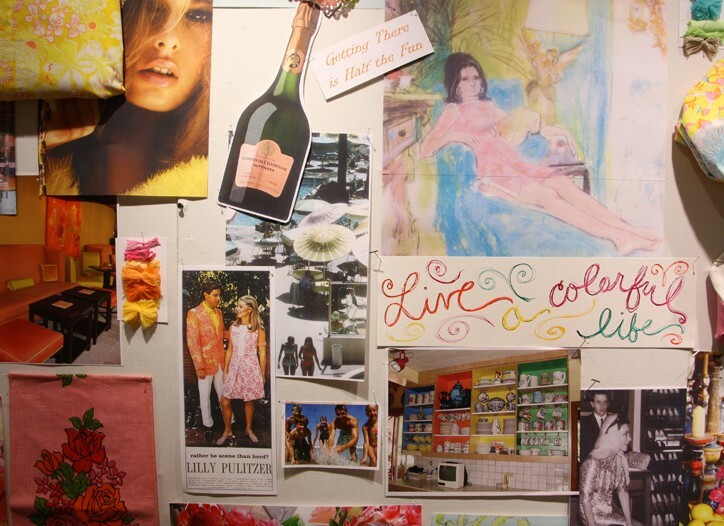 Here is an inspiration board from Lilly headquarters in King of Prussia, Pennsylvania. 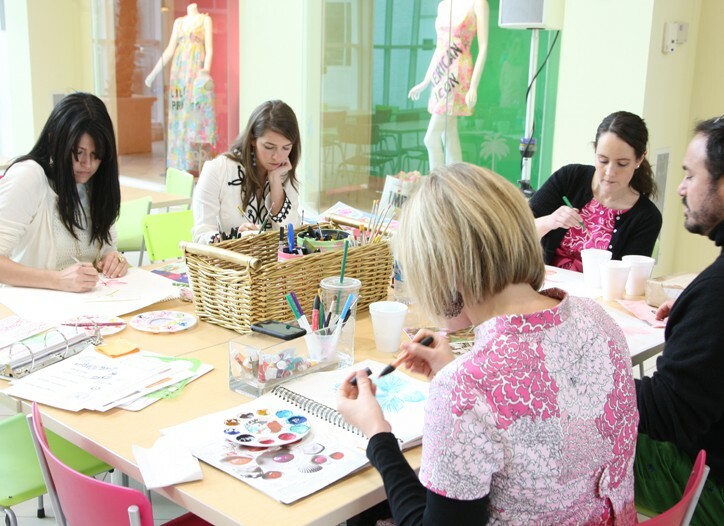 Below, members of the Lilly Design Team experiment with color. And this from Kate Spade…. Still to come? A Florida’s Natural orange juice carton done in one of the signature Pulitzer prints. An altogether remarkable story, quintessentially American with its ups and downs, and its happy ending for the company’s founder. 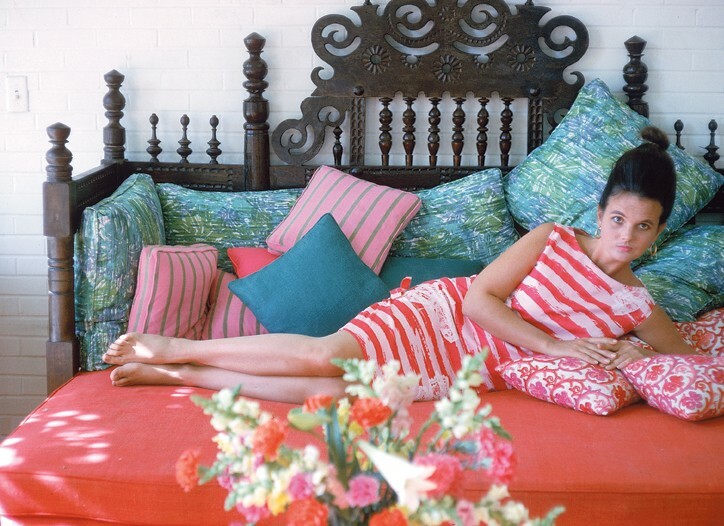 Although she no longer owns the company, Lilly is still on hand as a consultant; her design influence and imprint can be seen everywhere. The WWD special edition was written primarily by Julie Naughton with contributions from Dianne M Pogoda, and they did a bang-up job IOHO. Here at the Prepatorium we realize almost everyone is interested in Black Friday, or perhaps Cyber Monday. In a word: savings. Everyone is seeking sales. Discounts. Markdowns. Tips on ‘fiscally friendly’ shopping, we know that. So what is J. Crew doing for you come Friday? They are opening at 6 a.m. and all sweaters are 20% off, with Clearance items also an additional 20% off. Things are already heavily discounted online, like the Girls Riley Critter Cord in bright pink, available in all sizes as of this writing. The Crewcut Kids slacks were originally $54, now $19.99 and $30 with the price determined by the color you select. J. Crew Factory Outlet stores are doing a significant promotion of their own starting Friday, most opening at midnight. If it is difficult to read the small print up above, early risers who shop before 10am can take an additional 50% off clearance styles, nothing to sneeze at. Here is a list of all Factory Stores so you can check the hours. Another preppy retailer (perhaps the original), Lacoste, is offering 25% off all merchandise; this includes items already on sale. The discount is good through Monday, December 1 and free standard shipping on all orders is also included through Monday. Use promo code HOLIDAY1 to receive the benefit of these offers. Brooks Brothers is offering 15% off all merchandise online and in their stores. (See below for Factory Outlet store offers.) This promotion even applies to the Black Fleece merchandise from designer Thom Browne. Additionally Brooks is offering free shipping on all orders totaling more than $200. If shopping online at Talbots now, or in stores starting Friday, everything is 30% off and there is free standard shipping on every order. Stores open at 8am Friday and both promotions run through December 1st. For the Polo Ralph Lauren fans in the household, the Friends and Family promotion continues, offering 30% off all merchandise through December 8. The promotion code is HOL2008, and free shipping is included in this offer. Banana Republic continues their “Dressed in Holiday Style” sale online and in stores. The sale runs through Monday, December 1st. At Banana Republic Factory Stores starting at midnight the discount is 40% off everything in the store. Tommy Hilfiger is offering substantial savings for Black Friday, and according to their news release, the discount is 50% off merchandise as opposed to the 40% shown in our graphic. There are also a number of coupons for specific savings at the Factory Outlet stores, such as “Save an Additional 25% on any $200 Purchase,” but we have no idea if one must have an “official coupon,” or if it could be printed off any site. Ann Taylor is promoting 30% off your entire purchase plus free shipping only through midnight Thursday. The promotion code for checkout is TURKEY. At Ann Taylor Loft stores, there are multiple promotions underway, including a $25 gift card for every $50 you spend starting online Thursday and in stores Friday. Hello-Hello… we do hope everyone enjoyed a simply splendid weekend! TP is a little crazed and dazed; here at the Prepatorium the holiday frenzy seems to have commenced earlier than usual! Let’s start by updating current and expected markdowns, sales & other discounts at retailers specializing in merchandise that tends toward a preppy aesthetic. Next, Banana Republic is already doing their “Dressed in Holiday Style” sale online and in stores. The sale runs through Monday, December 1st; we consider this the retailer’s Black Friday sale. The coat comes in a variety of colors and is now $118; originally it sold at $198. Black Friday at the Banana Republic Factory Stores offers a substantial opportunity for those with the patience and sanity to cope with the crowds: 40% off everything in the store. Many of the factory stores open at midnight; check your local store to confirm shopping opportunities. We do have a new J. Crew discount offer. Spend $150 and take 20% off, spend $200 and take 25% off, spend $250 and save 30% off. The promo code on this one is TURKEY. BTW, if you missed our original J. Crew Black Friday post, just click here. Also, don’t forget, the “take an additional 20% off sale prices” deal ends tonight. TP is guessing that somehow, someway, we’ll see this back *before* the end of next weekend or another incarnation of the offer. Definitely something on Cyber Monday. If shopping online, the promo code is EXTRA 20. Neiman Marcus is offering what are truly amazing markdowns for that establishment, certainly this early in the season. For example, the Cole-Haan Air Genie ballerinas are now only $80 from an original price of $175. Delman’s Quilted Suede Ballerina flats are $117, from $315. Don’t overlook the markdowns on your favorite brands in apparel and accessories. Below left, from Lacoste we show the Trucker hat, originally $57, now $35. (This is the Lacoste hat Michael Phelps is frequently seen sporting.) And lots of children’s items are also on sale; the Lacoste Zip Sweater that was $95 is now $57. One of TP’s favorites, Garnet Hill, is starting their Thanksgiving Sale and Clearance now. Temptation is difficult to resist when it comes to the winter theme Hable pillow covers by Hable, now $34 each. The Painted Wood picture frames are also swell and almost 50% off their original price of $36, now $19. Arguably today’s “most bang for your buck” item is the cashmere offered at Garnet Hill. Women’s Cashmere V-neck Pullovers are $64, down from $128, as are the Crewneck Cashmere Sweaters. TP can assure readers that unless something has gone horribly awry, these are excellent additions to one’s walk-in, of good quality and ever-so-snuggly. If you like the apron with bright pink circles and/or the Preppy Stripe note cards and would love to have both absolutely free, be sure and leave a comment to this post telling us one thing you are thankful for. Anything at all. Someone’s name even – that’s it! And you’re entered in the Great Preppy Giveaway! Yesterday we mentioned we would showcase a few items of note in the Vickie’s Secret fashion show. Should this be declared preppy lingerie? Perhaps our wonderful Nautical by Nature can advise us on the next look… Miss Kate, does it qualify as officially nautical in your educated estimation? BTW, the models look absolutely stunning. The show airs on CBS December 3 at 10 o’clock.